We have a top 20! Two more Asian guilds hop on the 8/8 train and form the Asia top 5, as Chao Jie grab the World 17th, getting it before Honestly, and Skyline actually got their G'kill before Big Dumb Guild, in at World 15th! And so it's Skyline, BDG, Chao Jie and Honestly in spots 15-18, with P G getting the 19th and PMA the 20th! Wiping As Intended also finished up Uldir in 21st spot. The remaining spots for the front page are rapidly vanishing, as Honestly claim the World #17, US/OC #4 kill on G'huun, whilst at the same time taking the Alliance #2 spot. We have a US/OC third! 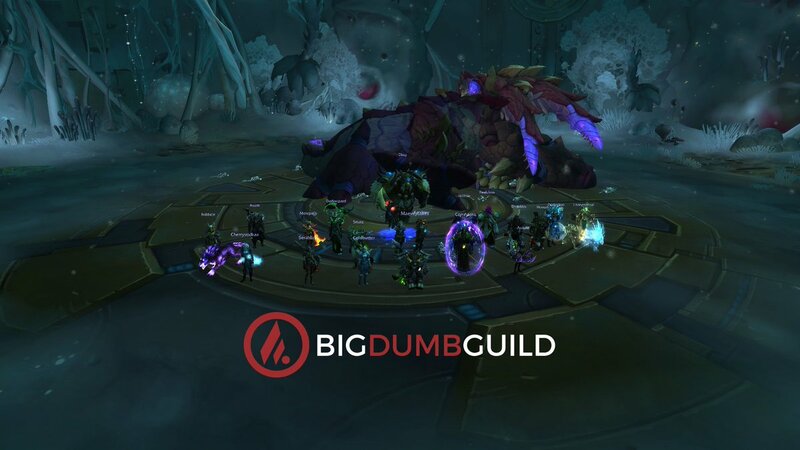 Big Dumb Guild, who got three World Firsts at the start of Uldir, have now finished up and are on 8/8, having downed G'huun World 16th! It seems my usual powers have returned as it took a whole hour from me mentioning no new kills for From Scratch to get the World 14th EU 9th! 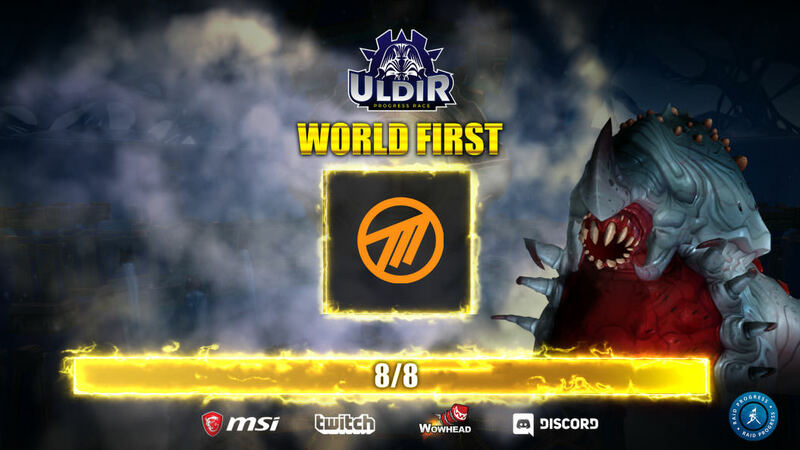 While waiting for a few more, it seems kills have stalled and only NollTvåTre have gotten past the final hurdle of Uldir yesterday, claiming the World 13th, EU 8th! Another G'huun downer, as AFK R get the Asia 3rd, World 12th kill and finish up Uldir! More G'hkills as Aversion get the 11th slot and finish up Uldir! EU 7th. 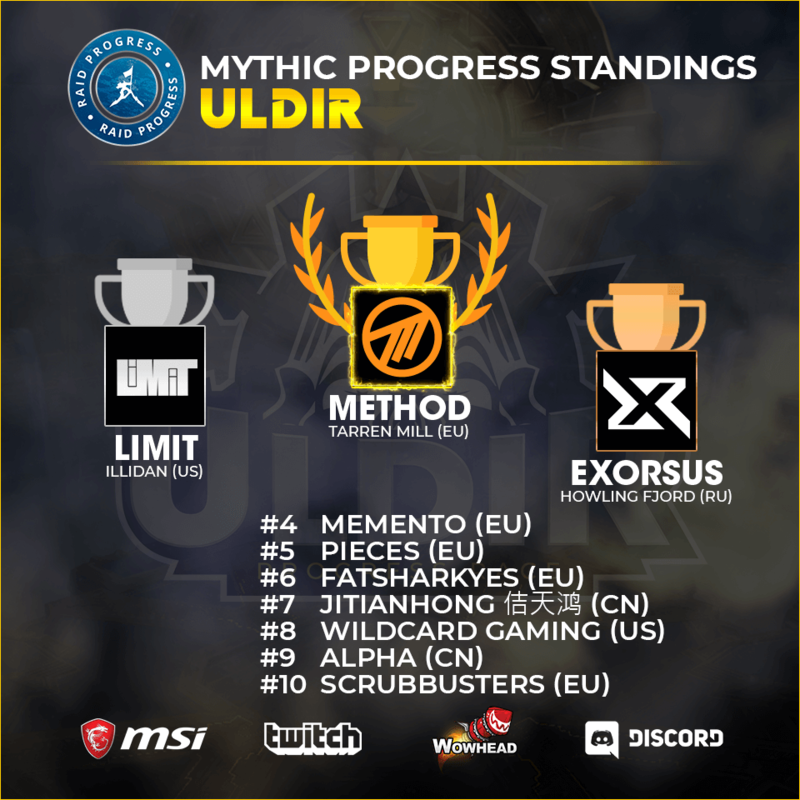 The Mythic Uldir Top 10 is here! And we have a top 10! ScrubBusters claim the final spot and get G'huun down EU 6th! Alpha re the next to finish up Uldir and down G'huun, claiming he Asia 2nd as well as overall 9th! Only one more guild to go until we get the 10 best guilds of the first raid of Battle for Azeroth! Only two spots remain in the top 10, as Wildcard Gaming claim the World #8, US #2, kill on G'huun! Asia have itself a champion, and their name is Jitianhong! They've gotten G'huun down World #7, Asia #1! FatSharkYes claim World #6, as they are the latest guild to kill G'huun! The top5 have been finished! Pieces claim the last spot, killing G'huun as World #5, EU #4 and are now done with this Uldir! Limit released their World 2nd G'huun video! Remember, this is without the extra loot from the weekly reset of Mythic Uldir! Memento get the World 4th, EU 3rd on G'huun, clear Uldir mythic and take their place in the top 5! And now they are three. Exorsus have killed G'huun as World #3! Big Dumb Guild are now on their way to G'huun as they've become the 4th guild from the US and making them the 16th guild in the world to take down Mythrax the Unraveler. AFK R from Korea join the ranks of taking down Mythrax the Unraveler becoming the 3rd guild from Asia and World 15th to reach 7/8! Check out the latest Allcraft ft. Sco, Asmongold, Method Josh, Hotted & Rich. They talk about the process of the WF race, the future of raiding, and having a great time taking questions for the audience. AllCraft : The World First Race Show! 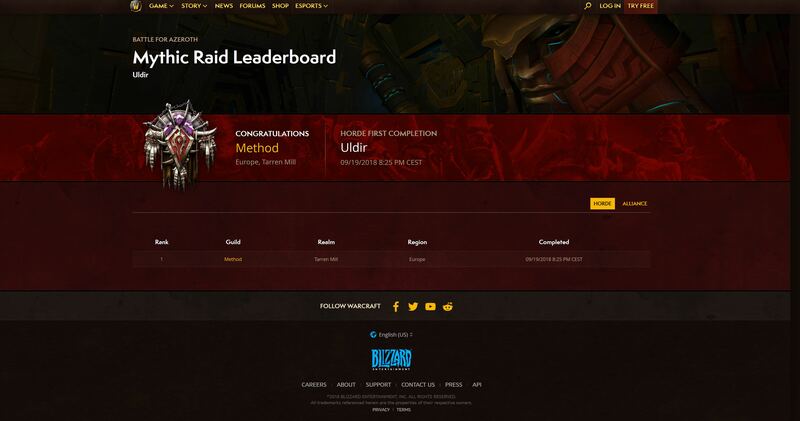 "Method secured the World First kill for Mythic G’huun in unprecedented style, streaming the kill to over 260,000 Twitch viewers with Sco as the #1 most-watched individual streamer on Twitch this past week. In this article, we'll highlight the streaming stats of the World First race and how it compares to other popular streamers this past week." More Mythrax down as Aversion and From Scratch grab the EU 8th and 9th, World 13th and 14th! Two more kills have rolled in for Mythrax, as both NollTvåTre and ScrubBusters have him slain. They both now sit at 7/8 as World #11-12, and EU #6-7. Honestly have managed to get past Mythrax, as World #10, US/OC #3, and now sit at 7/8. And here come Limit's World 2nd kill nerdscreams! Limit got the World 2nd kill, as expected! They really showed us they're a force to be reckoned with, and were in the lead for a long time. If they hadn't extended their lockout as they did, the race might have turned out differently. In any case, the next raid is going to be VERY exciting as not only have Limit really upped their game, they are also planning on going full-time for the next raid! And, of course, congratulations on the kill! And here's the wipe count for all of Uldir, including the 285 on G'huun! The Method G'huun kill was the first to ever be entered into the new Hall of Fame on the official WoW site! Method have done it! G'huun has fallen and it's yet another World First for WoW's premiere raiding guild. An amazing achievement, taking only a couple of hours after the re-clear! 8/8 is complete and the first raid of Battle for Azeroth made it to Blackwing Descent status, with G'huun surviving to week 2. However, Nefarian 2.0 still remains the last longest living boss of the first raid of an expansion, having survived for 27 days! This marks Method's 10th endboss World First, if you don't count the "legit" Vashj kill, which is a huge number, unmatched even by Nihilum, who are (and will forever be) at 8, with Paragon next in line with 7! Huge congratulations to the guild on their achievement, getting it done while streaming and showing off their tactics to everyone, proving that Method really are the best. The race is incredibly tense right now, as Method have gotten the boss to sub 2%, and Limit should also be back and progressing, after their multiple sub 1% tries. It's still anyone's race and G'huun is proving to be one tough customer! Method have now managed to reclear 7/8 Mythic, as well as done a Heroic clear. They're now back to G'huun progress, and let's hope they have better luck than Limit, and not sit here all night with sub 1mil HP wipes! Whilst all eyes are on Limit and Method to see who gets the WF in the new reset, the Asian servers are still going strong before the weekly reset tomorrow. Alpha have gone ahead and joined the top dogs, killing Mythrax as Asia #2, World #9! As expected, Method are indeed re-clearing and getting that extra loot to help them get that last 4% down. Method did indeed call it a night a while ago and we'll be seeing them back at 9am CET! Now it's all Limit for 7+ hours - can they get that WF kill? Another record pull for Method, as they hit 4.1%! The plan is to go sleep in around 30 minutes, at midnight CET, but if they get a few more tries like this they might extend their stay til later, just like they did yesterday. Mythrax gets unraveled once again as we have the World 8th kill! FatSharkYes get the EU 5th and 7/8 and head to G'huun! Here comes Method's World 2nd Mythrax actual video, with muliple PoVs! We're sub 5% with Method's pre-reset attempts as Limit are reclearing/perhaps have recleared already, with a clip to boot! It seems almost inevitable we get a kill today and with Limit's current advantage of a full reclear's worth of loot, they may just get the first US endboss World First since Blood Legion in heart of Fear! The weekly reset has landed in the US, meaning people on the US/OC servers can now open up their M+ and PvP caches, and start their reclears to get back to progress. Thus far, the only guild who's started their reclear that I'm aware of is Limit, but we'll have to wait and see how long it takes for the guilds to get back to their previous progress! G'huun is still alive, but I wouldn't say that he is well, as he's dropping further and further down in health as the guilds progress on him. Out of the top guilds the only confirmed % we have is for Method, and the best try they've had this far has put him down to 10.6%. If the progress keeps going at the same pace, we can expect a kill to roll in sooner, rather than later! 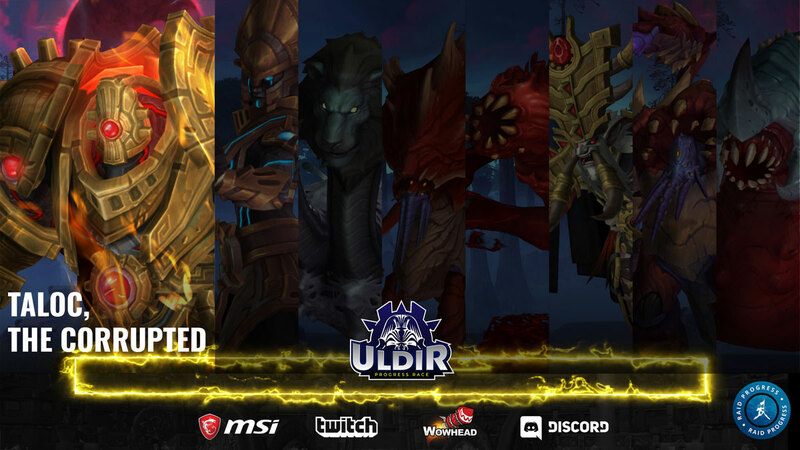 Wildcard Gaming brings in the 2nd US guild to take out Mythrax the Unraveler bring a total of 7 guilds battling it out with G'huun! And we have another Mythrax kill, this time by Jitianhong, grabbing them the Asia first, World 6th! We have a US/OC 4th, World 22nd on Zul, Reborn by Alacrity. And Method finally take their sleep break at 3 25 AM CET, which means it's Limit's big chance to get the World First for the day, as they'll have at least 5ish hours of progress before Method are back or the US guild decides to sleep themselves. While there have been plenty of relatively low % tries (12-15%), it's still relatively not certain if he's killable this week. Also, today is the US server reset, so Limit will have to decide whether to re-clear once that happens (which is the most likely scenario) and lose a few hours, or risk it and keep going at G'huun with the gear they have at the moment. For those of you not following the stream, Method's best attempt so far was 12%, with the most recent one ending at 15%, so they're getting the boss below 20% fairly regularly. It remains to be seen how long they'll keep at it today, with them either smelling a kill is near or perhaps being nervous about going to sleep at letting Limit progress alone and possibly waking up to the boss being dead. Not much happening in terms of kills, but Method is pushing pretty hard today, as they're still at it with G'huun in their sights, as they're already raiding some 1-2 hours longer than usual. We did have a few more Zul, Reborn kills with Wiping As Intended, The Unnnamed and PMA getting the world 19-21st and EU 11-13th. It seems G'huun may not live to see another reset (or even day), as Method's best attempt just happened at they got him down to 14%! Pieces joining and becoming the 5th guild to grab the 7/8! So we now have four EU guilds progressing on G'huun, with the only non-EU guild actually in the lead (at least in terms of time spent on the final boss). Method's best tries so far have been in the 60% range and we don't really know Limit or Exorsus statuses, so presumably there's still a long way to go. Skyline grab that final spot on the Asia Zul top 5 and head to 6/8. Memento are doing all they can to show the strength of the Finnish raiding community, getting past Mythrax and now sit at 7/8 as World #4, EU #3! Right have been racing up the ladder, getting down Fetid and Zul putting them up at 6/8 as World #17 and Asia #4. It seems like a certain Zul has been Reborn a fair few times this week, as he's died a few more times since we last did a report on him. ScrubBusters and Future have gotten him down and now sit at 6/8, and World rank #14 and #15. Exorsus are back! The third guild to down Mythrax and EU second, they join Limit and Method at the top on 7/8 and on to G'huun! If G'huun proves to be a real challenge, and even lives to a second reset, the lead the first two guilds have may not be as relevant, so there's still a good chance we see the Russian guild get to the top and pull an upset! A bit a of a late update, but Alpha have also moved past Zul, Reborn and have been progressing on Mythrax for quite a while now, joining the now 13-strong group on 6/8 just before FatSharkYes and claiming the Asia 3rd. FatSharkYes are next in line in slaying Zul, Reborn, and now sit at 6/8 with a world rank of #12, EU #7. Method have done what they are good at, and have slain Mythrax World Second, EU First, and now sit at 7/8. Let's see how hard G'huun turns out to be! Honestly have caught up with the main pack sitting at 6/8, getting down Zul, Reborn as World #11, US/OC #3. And we have the Killshot from Limits World First of Mythrax the Unraveler! This race has actually played out pretty much as expected if you take out the whole Fetid Devourer factor, with the bosses not being that much of a challenge overall. Now G'huun, on the other hand, is a bit of a mystery, as we can't compare him to last expansion's first raid endboss, Xavius, since he was awfully undertuned. So what could this mean for Uldir's head honcho? Will Blizzard overtune him to make up for Emerald Nightmare? The rest of the bosses, Devourer aside, have pretty consistently followed the first raid in the expansion difficulty curve, taking 2ish days to down with the US guilds taking the lead. Now, it's entirely possible Limit simply has a better strategy and execution and Method or anyone else for that matter won't be able to catch up in time, but if it's a normal progress scenario, we'll be seeing more guilds on 7/8 today, meaning G'huun's difficulty being the determining factor. If he's as "easy" as the rest of the bosses minus Mr. Fetid, Limit's lead could prove crucial and we could be seeing the first US World First since MIsts of Pandaria and its first tier, where Blood Legion got the WF on Empress Shek'zeer in Heart of Fear! In any case it's going to be a very exciting few days now, as Method and the rest of the guilds rush to catch up to Limit! Limit with a World First, downing Mythrax the Unraveler. They are now the only guild sitting at 7/8! We've got 10 guilds with Mythic Uldir Progress at 6/8. We have one from FR, KR, CN, and RU. Total of two guilds from the US & four guilds from EU. We've got 3 more kills on Fetid Devourer, with FatSharkYes, Alpha and Aversion getting him down, rank 12-14, with Alpha also getting Asia #3 in the process. They truly know how to scratch their way back to the top, as From Scratch has in short order gotten past Zul, Reborn as well, putting them at 6/8 World 10th, EU 6th. AFK R keeps doing what they can to prove the worth of the Korean wow community, getting World 9th, Asia 2nd 6/8, having gotten past Zul, Reborn! From Scratch are doing their best to scratch their way back into the race, by downing Fetid Devourer, World #11. Pieces have gone ahead and joined the top dogs sitting at 6/8, killing Zul, Reborn as World #9, EU #5. We also have a kill by Jitianhong on Zul, which is somewhere in the World #4-6 range, will need to look into it to verify exactly where they rank, but they did at the very least get Asia #1! I'm not sure how many times Zul can be Reborn, but he'll need to do so once again, as NollTvåTre have slain him, putting them at 6/8 as World #6, EU #4! Zul, Reborn is not having a good time, as he's now been slain again, and this time by Memento! This now puts them at 6/8 as the World #5, EU #3. Exorsus are doing their best to catch up, getting Zul, Reborn down EU 2nd, World 4th, and join the pack sitting at 6/8! With there being a lull at the top-end when it comes to new kills, let's take a look at how the mythic kills further down the progress tree is shaping up. Out of these guilds, 629 are based on the US realms, 907 in EU, 18 in Brazil, 76 on oceanic servers, 13 in Korea and 12 in Taiwan. As always, the Asian servers are harder to track, so hard to tell how accurate those numbers are. AFK R keep up the good pace, getting Asia #1 World #9 on Fetid Devourer, and they now sit at 5/8. Zul, Reborn will have to live up to his name, as he's been slain once again, this time by Wildcard Gaming, putting them at 6/8 World 3rd! More Fetid Devourer kills as Pieces claim the World 8th, EU 5th, just behind Exorsus! 5/8 and on to Zul, Reborn. Exorsus finally break through and down Fetid Devourer World 7th, EU 4th. Now Zul stands between them and the top two. While it's a little strange seeing them this far down the rankings, Devourer has been an issue for some guilds, even after the nerfs, so we might still see Exorsus climb back up to the very top and be a threat to Limit and Method. 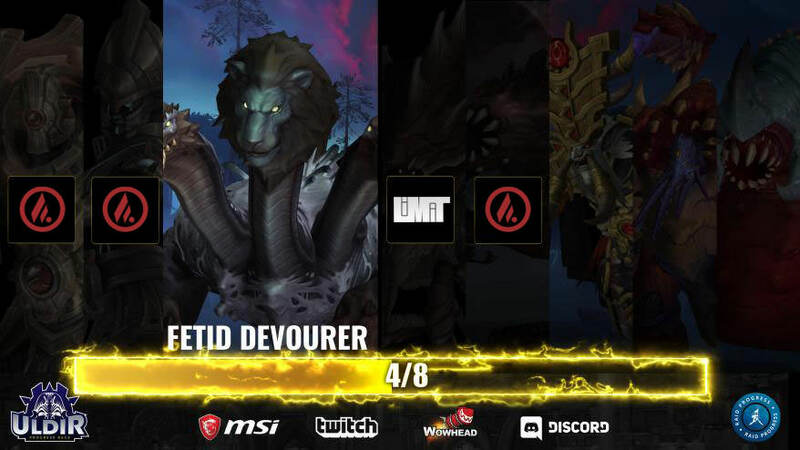 Another guilds gets past the previous gatekeeper, Fetid Devourer, as NollTvåTre claim the World 6th, EU 3rd and head to 5/8! Limit are back with the Zul, Reborn World 2nd! 6/8 and back to even with Method. Obviously it's a US/OC first and it took them 16 hours from the Devourer kill, but that's including a sleep break. As Method's best try on Mythrax is around 60%, Limit can still catch up, but are at a 3 and a half hour deficit on Mythrax attempts. And here's Limit's World First Fetid Devourer killshot, as we wait for the video! Well, I suppose sleeping is just a bad idea during progress as I one again missed the big World First. It seems Zul was either undertuned or correctly tuned for the spot he's in, depending on how you look at it, considering it's the first raid and he isn't even the penultimate boss. In any case it's slightly disappointing to me as it took Method a little under 5 hours to down him after the 2+ days they spent on Fetid Devourer. It's also very clear that the second nerf was indeed what made Fetid Devourer killable, and it seems he's now relatively normal in difficulty (although still harder than his peers, including Zul it seems). The problem here is that hotfix timing. There's basically no time that the hotfix could have arrived that wouldn't impact the race negatively, as US/OC guilds had way more time than EU after the hotfix, which is visible from Method's quick Zul kill. This isn't a problem for now and for Fetid, but imagine if this had been G'huun. Something similar happened already, back in Vanilla, and it was another Old God to boot. C'thun was completely unkillable in Ahn'qiraj and a hotfix landed right in the middle of EU progress, granting Nihilum the World First by default. So, I suppose we should just hope there is no more need for hotfixes on endbosses, although we don't have to think back too far for when it last happened, with Kil'jaeden getting a ridiculous number of (mostly secret) fixes back in Tomb of Sargeras. Method downs Zul, Reborn World First, now sitting at 6/8 giving them a fairly big lead over the rest of the competition! Fetid Devourer is having a really hard time right now, going down once again. Memento now sits at 5/8, World 5th, EU 2nd! Honestly have taken a step up, taking down Fetid Devourer as World 4th, US/OC 3rd! Method goes ahead and gets EU First and World Third on Fetid Devourer, and now sit at 5/8! Wildcard Gaming have gone ahead and dispatched of Fetid Devourer, putting them at 5/8, World and US #2! Please note that majority of the Chinese guilds are not listed. Just the top few guilds from that region. 27 guilds are now at 4/8, and the Vectis kills keep coming in, with Strawberry Puppy Kisses, Alacrity and Instant Dollars finishing up the top 10 on the boss. And it's Limit! A huge achievement as they break through the 4/8 barrier and claim the World First! Fetid Devourer down! There's only three bosses left in Uldir and it's quite possible they won't be as hard as Fetid Devourer was. In any case, Limit are the first guild to get to 5/8 and move on to Zul, Reborn! The Vectis kills keep stacking up, but we now have another US/OC one, making it 7 in the region as Vision come up to 4/8. NollTvåTre, Ebrius and Wait for it finish up the list of the 11 EU guilds now on 4/8. There seems to be some confusion on the rankings once again, as Wowprogress has Aversion and P G getting Vectis before Pieces, but they haven't been registered yet on raider.io. So for now we know three more EU guilds got Vectis and 13 total guilds are on 4/8 at the moment! Another Vectis down as Pieces claim the EU 5th, World 12th 4/8. We have an EU 4th on Vectis! Hope n Despair grab the World 11th and join the 10 strong group on 4/8! The Chinese have truly joined the race, with Alpha getting Vectis Asia #1, World #10! Honestly is keeping the banner high for the blue portion of the playerbase, getting Vectis down World 9th. A new day dawns in the EU, and the dayraiding guilds come back to bash their heads against the wall that's known as Fetid Devourer! With the changes to how gear is acquired in raids the guilds have been getting far less from their split runs during the Heroic week. With that in mind, the question now is, what is the best way to gear up, doing more Heroic splits, doing PvP, or spamming M+. Method seems to have decided that M+ is the best way, which is why they are doing M+ right now rather than raiding. Two more Asian 3/8s have arrived, with Alpha getting the Asia 2nd and Jitianhong the 3rd! Asia servers have come up and the Chinese and Korean guilds are at it, with our old pals at AFK R seemingly in the lead on 3/8, with Zek'voz down, while Alpha, KeaHoarl, Jitianhong and 鼎鑫 have passed Mother and are on 2/8! Vectis is on a losing streak as he dies again, this time to vodkaz! World 8th and US/OC 5th and 4/8 for another venerable guild. Vectis goes down again! Blood Legion are the next to get the giant blob down and claim the World 7th, US/OC 4th! It's good to see them return after that little break from top raiding and get into the mix once again. We have a lot more Zek'voz kills on both sides of the Atlantic, and the US/OC got a top 10 on 3/8, with Infinity, Club Camels and vodkaz moving on to Vectis. Wildcard Gaming jumps up tp 4/8 and get the World 6th US/OC 3rd on Vectis! With Fetid Devourer being a huge obstacle and may need further hotfixes to kill (with the previous nerf being huge, indicating there was no attention paid to the testing of the encounter), it could now be a matter of who gets the hotfixes first, US or EU, since that will be the region that gets the kill first. And here comes Method's most recent and World 3rd kill, featuring Vectis! Memento are here to show you what Finland can bring, getting 4/8 World 5th, EU 3rd! A whole lot more guilds got Zek'voz dow in the EU, with Memento, Future, Aversion, Clique. Herzog Igzor and FatSharkYes making up the top 10. With Method live-streaming their progress, the release of kill-videos has been speed up, so let us present the first 3 bosses in Mythic Uldir! It's nice to wake up to no additional kills, especially when it's the first raid of an expansion. Fetid Devourer seems to have stood his/its ground and slowed even Method and Exorsus down, even after the nerfs received yesterday. Could this be the next Zor'lok from heart of Fear, or will it just be a bit of a slow down for the top guilds? Exorsus have caught up with the leading pack, getting 4/8 killing Vectis World Fourth, EU Second! Method is at it again, making Vectis take an early retirement, putting them at 4/8 EU First, World Third! With Vectis looking like the first real hard boss, let's look at how things are going for the other day-time raiding guilds in EU. Waít for it just got 3/8 as EU 4th and World 11th. At 2/8 we have a total of 8 guilds, with Gambit and Memento the last two to join that group, taking EU 11th and 12th. The last group at 1/8 is now 6 guilds big, taking it up to 18 guilds from the European zone who have killed a mythic boss. The top 3 for EU have all gotten to 3/8 now, with Exorsus slaying Zek'voz, netting themselves the World #10 and EU #3 spot! Pieces have done as Method before them and gotten up to 3/8, killing Zek'voz World #9, EU 2nd! Method have gone ahead and slain Zek'voz, Herald of N'zoth as EU First, World #8, meaning they are almost caught up with the leaders in the US! Exorsus round up the top5 for EU getting 2/8 with MOTHER dying. It seems that quite a lot of people will need to do some extra work on MOTHER's day, with the latest guild to slay her being Waít for it getting 2/8 and EU 4th. And we've gotten ourselves an EU Third on MOTHER! Sloth have come out to show what the Spanish players can do! Pieces is doing their best to not be left behind, assassinating their MOTHER as EU second putting them at 2/8! Method have gone ahead and gotten rid of their MOTHER, putting them up at 2/8 and EU First! It looks like TG Gaming managed to kill Taloc before Herzog Igzor, putting TG at EU 5th, Herzog Igzor at EU 6th, and a new kill by Sloth giving them EU 7th. As always it's interesting to see just which guild is daytime raiding during this first day of progress! We got ourselves EU 4th and 5th Taloc down. Depthcore and Herzog Igzor got him down respectively. Taloc have starter to fall. Hard to tell this early who got the EU first, but at least Method, Pieces and Exorsus have all killed him. Let's wait and see who got the official EU first. The raid is now up in the EU, let's see how quickly the EU guilds can catch up, and best of luck to everyone! And Limit are back among the top as they down Vectis World 2nd and join Big Dumb Guild on 4/8! It seems Fetid Devourer has been deemed too difficult by Blizzard and he's gotten the nerf treatment already! Big Dumb Guild finally take Zek'voz down and take the lead at 4/8, still being the only guild to have downed Vectis. After a couple of 1% wipes they come through to the No.1 spot, passing Limit and leaving everyone else being on 3/8. Let's see if they can hold the lead and capitalize on their 1 boss advantage or if Limit will bounce back. N'zoth's Herald is having a rough time of it this last half hour or so, as he goes down again, this time to Blood Legion. THis brings the 3/8 total to 7, and Big Dumb Guild even had a 1% wipe on the boss so we should be seeing 8 very soon. Fast on the heels of Vision, Midwinter also down Zek'voz, Herald of N'zoth and claim the World 5th, sliding into 6th place overall and heading to 3/8. More 3/8s coming in as Vision clear Zek'voz 4th. With that we have 5 guilds with three bosses down, with only Big Dumb Guild having gone the Vectis route, so they can presumably down Zek relatively soon and be the first to go to 4/8. We don't know what Limit are up to, whether they're pushing Fetid Devourer or moved to Vectis after BDGs kill, but we're sure to find out soon enough. More 3/8s as Alacrity head down the regular path and down Zek'voz World 3rd and join the top group in 4th place. Big Dumb Guild claim another World First, their third, as they down Vectis and head to 3/8 with Limit and Wildcard Gaming. We now have a bit of a divergence, as technically four bosses have died in Uldir, but no guild is on 4/8 just yet. Fused grab the 10th slot on Mother while Unity are just behind at 11, and both head to 2/8. With several guilds going back down to Heroics to farm up some more gear, including Wildcard Gaming, it might be a while before we see another higher ranked kill. While it's unclear what boss Limit are progressing on, it seems the fourth Uldir obstacle is at least a little harder than the first three, which might bode well for the general difficulty of the first race of Battle for Azeroth. Wildcard catch up! 3/9 and Zek'voz down! Limit still have a big advantage but at least now we have two guilds progressing on new bosses! Club Camel might have to switch as they join the 2/8 club instead! Remaining on their 9th spot they move on to face the next challenge in Uldir. More 2/8 updates as Benched down Mother and remain in 8th place. Will anyone dare go for Fetid Devourer or has Limit set the stage for many more Zek'voz kills? And here come the two World First kill videos from big Dumb Guild, via Method's PvP player Snutzy and BDG's own CherryVodka! Alacrity also down Mother and head to 2/8, landing in 7th place. Blood Legion bump up to 6th as they hop to 2/8 with their Mother kill. Limit pull ahead! They down Zek'voz, Herald of N'zoth, skipping the Fetid Devourer and get the World First! 3/8 and the top US guilds stays on top! We have a top 10 on Taloc with Club Camel getting their first kill in Uldir Mythic, as well as being the first Alliance guild to do so! As you'll remember, Midwinter were Alliance for a long long time but switched to Horde an expansion or two ago. Fused also got a kill and is in 11th place. No.5 has arrived as Vision down Mother and head to 2/8! They jump 3 spots over Benched, Blood Legion and Alacrity to join BDG, Limit, Midwinter and Wildcard Gaming on Fetid Devourer progress. More Mother kills as Wildcard Gaming catches up to the top 3. We also got the 9th guild joining the rankings with The Early Shift's Taloc kill. Mother falls once again as Midwinter claim the World third moving in front of Wildcard Gaming. Another entry to the 1/8 list, with Vision downing Taloc and making it 8 guilds to get their name in the rankings! So far everything is going as expected, two very fast boss kills and it's the usual US top guilds involved. Now the question is just how far this speed clear is going to go until there's a boss that takes at least a few hours and whether the EU and Asia guilds will have only G'huun left. Limit catch up to BDG and get Mother down for the World 2nd. We also have 2 new entries for Taloc, with Alacrit actually beating out Blood Legion and Benched grabbing the 7th kill. Big Dumb Guild down Mother! 2/8! Another World First and as expected the first two bosses went down quickly. There was also a fifth kill on Taloc by Blood Legion, so we now have 5 guilds in competition for the Uldir World Firsts. There's four kills on the first boss already and it's Big Dumb Guild that got there first it seems! They're closely followed by Limit, Wildcard Gaming and Midwinter! Today's the day and the US and OC server maintenance has ended and the guilds are able to enter Mythic Uldir! Just how many go in that quickly remains to be seen, however. 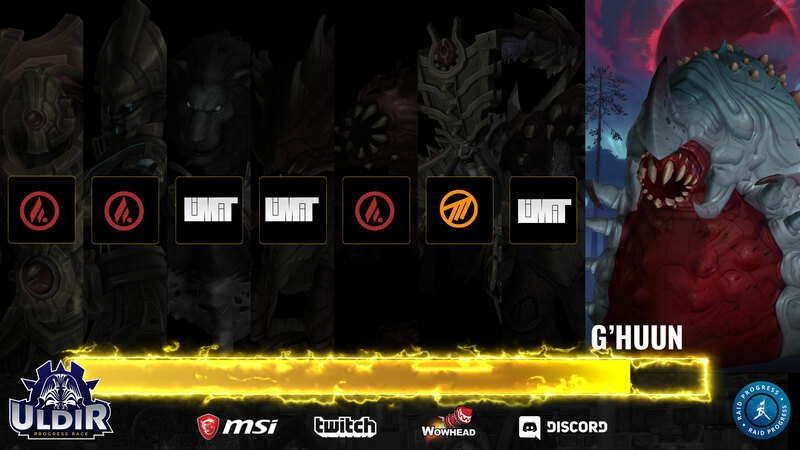 Of the potential contenders for the US/OC aka World Firsts on day 1 we have Wildcard Gaming, formerly Easy, who got the Heroic WF on G'huun, and we can be sure Limit will take a fair amount as well, with SNF or Big Dumb Guild possibly showing up for a first or two as well. There's also a massive hurricane on the US East coast at the moment which might leave some guilds a few members short, as they choose their own safety over fighting the Old Gods. While we wait for that first kill, you can head over and vote on how many days G'hunn will survive! Check out our pre-race interview with three of Method's raiders, Cayna, Naowh and Philwestside, covering pre-Heroic race preparations as well as their general thoughts on Battle for Azeroth so far. 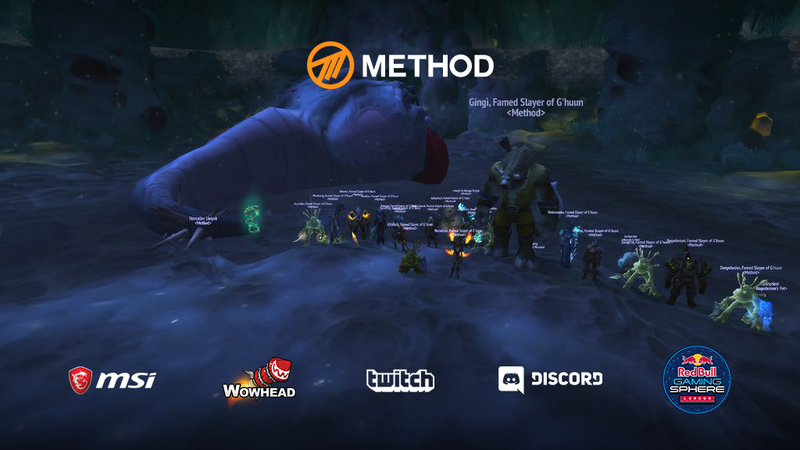 The huge announcement that will change the way we follow the race has arrived and Method is going to livestream their progress through Uldir Mythic! We're sure this will massively impact the way the race goes, from many more guilds getting the tough kills faster, without having to wait for kill videos, to the potential danger of Method losing a lot of advantage as guilds see their strats and tactics live. It's always hard to tell just how much of a guild's strength comes from the raw talent and skill of their players, how much from preparation and how much is advanced tactics and strategies - as we all know how kills of an endboss increase and come faster when the top guild publishes a kill video. As US guilds sill have that 2 day advantage, will handing them Method's strategies on a plate shift the balance of power in the race? Now, this is all presuming Method will still be the one to beat in Uldir, and also presuming Uldir will even be challenging at all, which all remains to be seen. And however Uldir turns out, will the livestreaming become standard practice for all raids also remains to be seen. The race starts on Tuesday, September 11th, when the US guilds will go at it and hopefully not do a full clear before the EU and Asia servers get their shot. In any case, you can read more about the decision to stream the race and just who will be streaming it over in the official announcement. What do you guys think of this development? We've been talking about guilds streaming progress for a long time in the progress thread now, and with Method opening the floodgates, we might see a lot more guilds do it. Heroic week is here and G'huun is dead already on day 1, as expected. So far only 1 guild has been logged as having killed it, Wildcard Gaming, but plenty more definitely have. In any case, it's warm-up week for the top raiders, with split raids and a looot of Mythic+ to gear up for the race start on Tuesday/Wednesday. Place your bets on how long Uldir will last! Battle for Azeroth is well underway and the race is looming ahead in the distance. We have three weeks to go until the gates of Mythic Uldir open and the very first progress race of the new expansion starts and the guilds begin rushing those bosses down. But just what kind of raid will Uldir be? Will we see a repeat of the embarrassingly short Emerald Nightmare, more of a very easy warm-up to the expansion, or will it be on the other extreme end of the scale like Tempest Keep in BC and not cleared until the next big patch? Place your bets in the comments below! In any case, we have the schedule for the opening of Uldir's various modes, but the big date to look for is September 11th, when the gates will open on the US side of things and bosses will start dying.